Butter Grater Is Greatest Invention Ever | OhGizmo! By David Ponce on 05/07/13 • Leave a comment! We like to call butter “flavour” ’round these parts. But the most frustrating part about spreading some cold hard flavour on your morning toast is how it just ends up shredding your caramelized slice of bread, and not spreading at all. It’s a first world problem, sure, but it’s one that’s elegantly solved with the above Butter Grater. 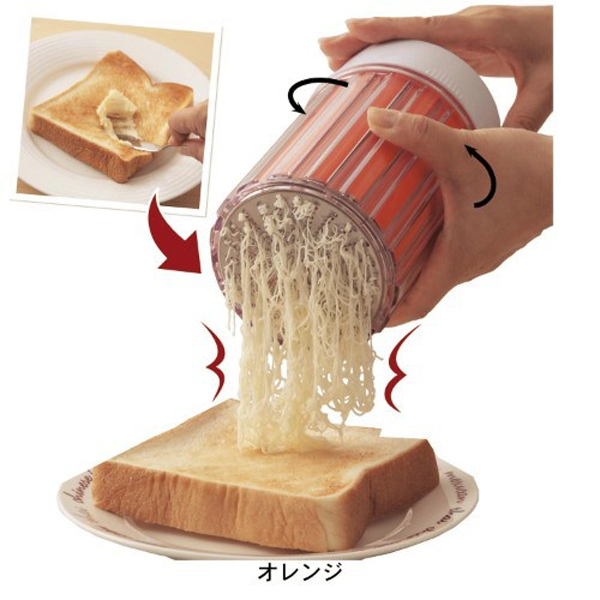 Just place a cold stick of delicious flavour in there, and watch as your former toast shredder comes out in fluffy filaments, ready for some easy spreading. It’s $23, from some Japanese vendor.